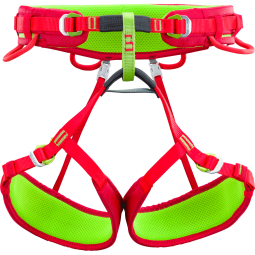 Completely adjustable harness, light, durable and easy to wear, developed for use in via ferrata, adventure parks and rock climbing courses. 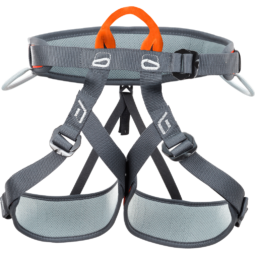 Fully adjustable harness, especially designed for adventure park, climbing schools and via ferrata. Lightweight and versatile adjustable harness with ergonomic lumbar belt and new adjustable T shaped leg loops to provide an enhanced comfort. Woman's lightweight and versatile adjustable harness, developed for mountaineering, ice climbing and sport climbing with belay loop extended and sizes of belt and leg loops specifically designed for female ergonomics. Lightweight and strong harness with new design and new materials providing excellent comfort and with breathable quick-dry lining mesh. All-around harness with strong and ergonomic structure which guarantees an excellent lumbar support. Adjustable full-body harness with new ergonomic structure designed to allow complete freedom of movement. 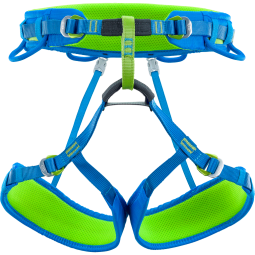 This harness is developed for children 95 ÷ 140 cm tall and weighing less than 40 kg. Innovative harness for high-altitude, expeditions, ski-touring and mountaineering, developed in cooperation with Tamara Lunger. Canyoning protection replacement for PRO-CANYON. Adjustable shoulder straps for a harness, with two adjustment buckles and dorsal support by the straps, it should only be used when connected to a harness.